I hope you are having a great fall semester in college. 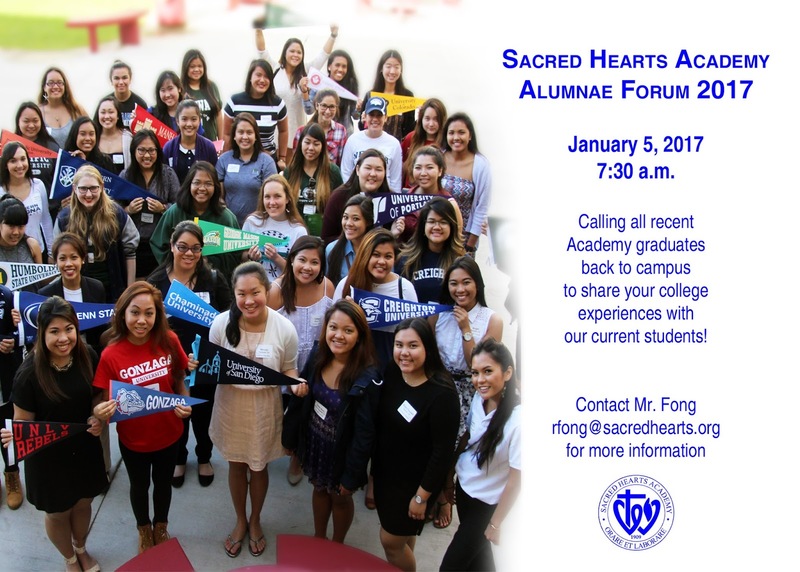 At Sacred Hearts Academy, we are getting ready for our annual Alumnae Forum, which will be held on Thursday, January 5, 2017. This is a great opportunity for recent graduates like yourself to come back to the Academy and share your college experiences with our current students. The Forum will be open to students in grades 7 - 12, and the format will be the same as last year with breakout sessions by grade level, including the morning start time. The tentative schedule is for the Alumnae Forum to start after morning homeroom. You should be on campus by 7:30 am for a short orientation. The forum will be followed by a breakfast meal and fellowship for all of you, and a mini college fair at recess (40 minutes). Last year we had 35+ graduates returning to our campus for the forum!